"Life is a set of values, that if not chosen carefully descend into slavery to the demands of the ridiculous." Behold, I will do something new, Now it will spring forth; Will you not be aware of it? I will even make a roadway in the wilderness, Rivers in the desert. God abhors ‘old.’ He is ever fresh, ever creating, always innovative. What He did yesterday He does not do today. 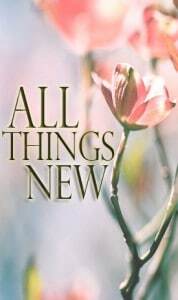 God has been, will be and is now moving in and toward His Altogether NEW. “All things” will be unlike and unrelated to anything of the old.